In 2000 Calin Toma started CARTO Wine Collection. 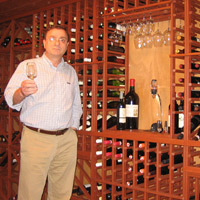 As a seasoned wine lover of more than twenty years, Calin was passionate about wine and jumped at the opportunity to start a dynamic company to represent many small but excellent wineries from old Europe’s lineage, a portfolio full of French, Spanish, Italian, Romanian , German and Swiss fine wines. Calin’s next task was to expand the company’s list of partners to include wines from many more countries and at various price points. Almost ten years later, CARTO Wine Collection represents more than 50 meticulously chosen producers from all over the world, a truly international wine collection of some very best and successful wineries. Some of them have been already recognized in many international wine competitions, in wine magazines reviews or are present in prestigious wine catalogs as Guide Hachette, Vino Italy and many others. Some are too small and have a limited international presence, but this makes them more rewarding when discovered. Guided by Calin’s passion and expertise, the dynamic CARTO team has developed a unique identity in the wine trade and has become one of Ontario’s most dynamic and far reaching supplier of fine wines to Vintages and the hospitality industry. Slowly and steadily its partnership list is growing constantly, with wineries in US, Argentina, Chile and Australia which will be added to the list in the near future. From brand selection to strategic planning, product launches, promotion, public relations and advertising, CARTO is covering all the aspects in the development and growth of fine wines and spirits. Now we are in the developing process of our internet presence so you can order your favorite wine directly thru our website.